The first jazz album for eight years from (many would claim – and I among them) our greatest living jazz composer opens with the perfect linking piece between that last jazz album, Sky Blue (AS0065), and what came in between, Maria Schneider’s first recording of her classical compositions, Winter Morning Walks (AS0121). It is Walking By Flashlight, which first appeared on Winter Morning Walks, the Ted Kooser poem of the title sung by the soprano Dawn Upshaw. Here the melody is taken by Scott Robinson on alto clarinet, as close an instrument to the human voice as you might get. It is set at the start against the piano of Frank Kimbrough, the bass of Jay Anderson and the accordion of Gary Versace, and Schneider’s signature sound is impossible to mistake. And the link to Sky Blue? Well, apart from the musicians involved, it signals that The Thompson Fields will continue where Sky Blue left off, and where Winter Morning Walks also ventured, though in a less personal manner: that is, exploring in tandem both the natural world and autobiography, the personal experience of this wondrous flora and fauna-filled landscape about us. 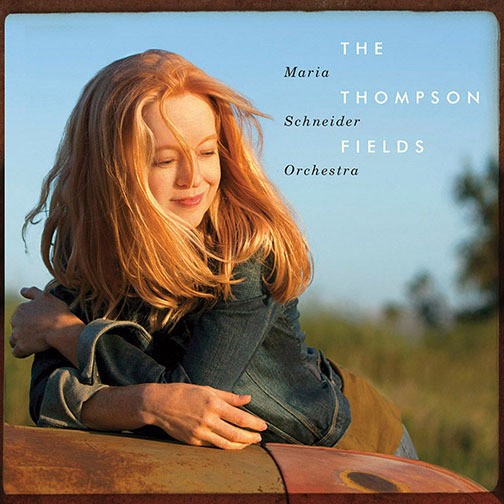 In Maria Schneider’s music its everyday – maybe even mundane – happenings and details are given, through intimate study and then through artistic “transmigration”, a transcendence and beauty that fills the heart and uplifts the spirit.